In the beginning, a person grows like an embryo inside his mother’s womb, thus far, at the “still” level; he simply nullifies himself. Then, he becomes as a little child who exists next to a grownup, and this is the “vegetative” level. After that, a person is an adult which is the “animate” level. All these levels are staged by the forces of nature, meaning that we don’t need to exert effort in order to evolve since Nature turns on the forces and desire to grow in us from within. In other words, it raises a request for development, MAN (Mayin Nukvin – female waters), on our behalf; it awakens in us on its own. 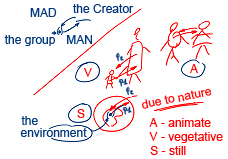 The Creator (Nature) acts from two directions. From within, the embryo strives to develop and nullifies itself in relation to its mother, and from inside, the mother’s organism nourishes the embryo and doesn’t treat it as a foreign object. Both are driven by basic instinct, mutual love for each other, a grown up to a child, and the child to the adult. On the animate level, at a more mature age, we still have to nullify ourselves in relation to each other in order to learn from the others. Yet, again, all of this is controlled by instincts. As for the development of the soul on the speaking level, the level of Human/Adam (Adam or Domeh in Hebrew), man, himself, must initiate the raising of MAN, the plea for correction. In other words, there has to be a desire coming from man himself. I have a desire to evolve, but I am unable and don’t understand what and how to do that. Everything is concealed from me, yet, to figure it out, I am given the group, the environment. This is why the collective soul broke. Attach them all to your point in the heart; you will receive the power necessary for the act. Your point in the heart is backed up by the group, and, if you receive assistance from it, you will be able to raise MAN to the Creator (who, in truth, also resides within the group). As a result, you will receive a response, MAD (Mayin Duchrin – male waters), the force of development, the Light that Reforms, from the Creator. It doesn’t matter where you work all day long; what matters is where your thoughts are as that’s where you are as well. However, your thoughts can be defined with the help of the environment. So, let’s agree that we will do our best to make sure none of us forgets, even for an instant that we must stay connected, thereby awakening each other. Let’s make this wish and together with all our friends around the world draw the Upper Force, the Creator, to this desire. Let’s force Him to help us think solely about oneness, only about mutual responsibility, the Arvut. If you don’t wake up, the others won’t wake up either, and if the others don’t wake up, tomorrow, I, myself, will be asleep during the lesson. There is no way out of this unless we take responsibility to provide the basic desire, having received it from the group, and with it, appeal to the Creator. Anything that Nature does with the embryo, a child, and any creature living in this world by pushing them toward growth, we must accomplish with our own free will and consciously start our own evolution. The most significant thing we can do is work on this connection each moment because sleep-walking through life is a sad way to live. Each moment is eternal. How come we can’t feel that? Indeed, we waste so much opportunity. We need to change.